The prevalence of multitasking has reached new heights. The newest technological advances have made switching between ongoing tasks and attending to several media sources at the same time not only possible but also seemingly easy. However, not everyone likes multitasking to the same extent, and individuals differ in their willingness to engage in multitasking behavior. Some prefer to perform multiple tasks at the same time, whereas others would rather finish one task before moving on to another. We argued that such a preference is related to a more general tendency to reduce ambiguity and uncertainty in one’s life or the need for cognitive closure. Need for cognitive closure is a basic motivational tendency to avoid and reduce ambiguity and uncertainty (Kruglanski, 1990, 2004). People who are high on this need desire order and predictability in their lives prefer structured environments, and often exhibit rigidity of thought. They are also faster decision-makers and better rule abiders. By contrast, individuals low on the need for closure are open to prolonging uncertainty and ambiguity, prefer changing and unpredictable environments, and have more flexibility of thought. They are also more deliberate (and slower) decision-makers and are poorer at complying with rules. There is also evidence showing that both groups process information differently, with the high need for closure individuals being more selective in what they attend to and more focused on selected information. It is, thus, no wonder that individual differences in the need for closure influence how one forms judgments of others, solves problems, makes choices, and what belief system they adopt (see Kossowska et al., 2018, and Roets et al., 2015). In a series of studies, we showed that this variable is also related to people’s preferences to either multi- or mono-task. Preference – do you like multitasking? Since the high need for closure individuals have a strong desire for a clear, structured, and stable environment, we expected them to be more likely to prefer working on one task at a time rather than switching between unfinished tasks. That is, we assumed that they would like to finish (or attain “closure” on) one task before moving to another, whereas the low need for closure individuals would rather switch between unfinished tasks, which is a more flexible, but (at times) also more chaotic way of working. In fact, this is what we found in a study in which we measured participants’ need for closure and multitasking preference in three independent samples (one from USA and two from Poland). We used the Need for Cognitive Closure Scale (Webster & Kruglanski, 1994) and the Multitasking Preference Inventory (Poposki & Oswald, 2010) to measure the two variables, respectively. Across the three samples, we have found negative correlations between the need for cognitive closure and multitasking preference, meaning that the higher the need, the lower the preference for multitasking, or the higher the preference for mono-tasking. 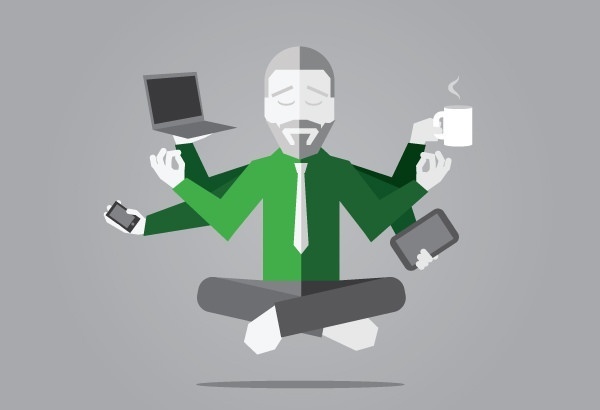 Behavior – do you actually multitask? In multitasking, however, like in other domains, preference does not always go hand in hand with the actual behavior. People might not be able to do the things they like or might be pressured (by norms, rules, other people, or situational demands) to do things they do not like. Therefore, we also asked our participants about their everyday behavior and measured their behavior in the lab. In one study, we used the Media Use Questionnaire (Ophir et al., 2009) which captures people’s extent of media multitasking, that is, how often, using a given media (e.g., instant messaging, social media, TV, print media), they at the same time use any other media. In line with our previous findings, high levels of the need for closure were associated with lower levels of concurrent media consumption. In other words, high need for closure individuals tended to use fewer media sources at the same time. In another study, we invited participants to our laboratory and presented them with a set of tasks, each in a separate Google Chrome tab. The tabs contained an online article, video, radio broadcast, a Sudoku puzzle, a set of logic problems, and an online game (air-hockey). Participants were asked to perform the tasks in a given time (40 minutes). Importantly, however, they were encouraged to perform the tasks in the most natural way — in the manner, they would perform them at home. They were instructed that they could switch between unfinished tasks as well as work on one task after another. Also, they were told that the time devoted to each of them, as well as the moment to move to another task, was entirely up to them. We thus made sure that our participants felt free to work in line with their natural preferences. Additionally, a special plug-in registered their activity, so at the end of the experimental session, we could tell how many times a person switched between tabs. We treated the number of switches as a measure of the degree of multitasking (the more switches, the greater multitasking). It turned out that those high on the need for closure engaged in fewer switches within the experimental session than those low on the need for closure. This, again, showed the lesser engagement in multitasking in high need for closure individuals. These findings are described in the article entitled How many things do you (like to) do at once? The relationship between need for closure and multitasking preference and behavior, recently published in the journal Personality and Individual Difference. This work was conducted by Ewa Szumowska and Małgorzata Kossowska from Jagiellonian University, and Agnieszka Popławska-Boruc from the SWPS University of Social Sciences and Humanities. Ewa Szumowska is a cognitive science researcher at Jagiellonian University | UJ · Institute of Psychology.